Book your stay at the newly renovated Courtyard Pittsburgh Downtown and experience a mix of rich Pittsburgh history and outstanding service and amenities. Our award winning hotel is located in the cultural district, just minutes from the David L. Lawrence Convention Center and surrounded by the areas top attractions. Looking for hotels near PNC Park or Heinz Field? We are conveniently located less than 2 miles from both stadiums. Renovated from 4 historic buildings our downtown Pittsburgh hotel accommodations exude style and comfort with large work areas, plush bedding and free Wi-Fi. Guests can enjoy an on-site breakfast with healthy and made to order selections from The Bistro or indulge in fine wine & cocktails from one of the many nearby restaurants. Our expert event planners will ensure your next meeting or special occasion is a success in one of our 3 flexible event spaces. Surrounded by the best of Pittsburgh, explore this exciting city from our Downtown hotel! The Bistro - Eat. Drink. Connect. 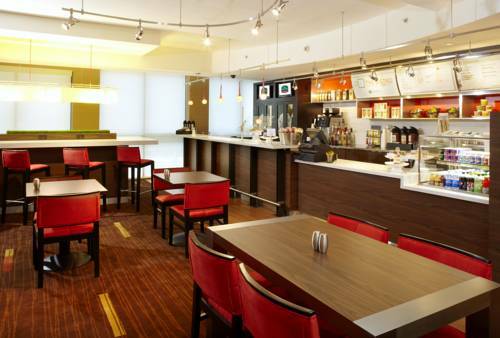 : Your on-site food and beverage destination for refreshing breakfast choices in the morning. The Bistro also offers specialty beverages made with Starbucks coffee to help you get a jump on the day.